Join us for our new 5 day baking course*, each day taught exclusively by Richard Bertinet. 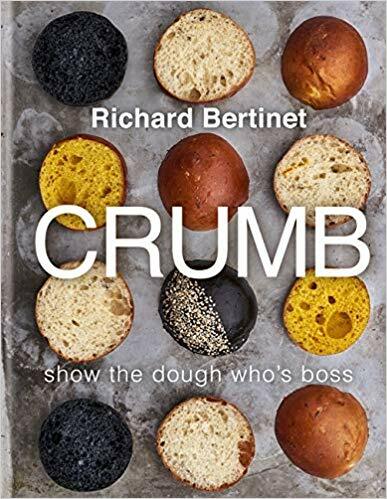 Suitable for those of you who are new to baking and for those more established bakers who wish to broaden your bread horizons with new recipes from Richard’s extensive knowledge perfected over 30 years, all now put down in writing in his new book Crumb. We start the week with 2 days focussing on enriched doughs, that altogether silkier almost melting dough that works perfectly with savoury ingredients as well as the more traditionally expected sweet variety. Master a Babka (Russian plait), Challah, Gotchial and a plum tart. Day 2 takes you further into enriched doughs, adding the element of layered doughs or laminated doughs. You will be making cheese twists (with a pâte feuilletée), toasted pine nut, honey and pear croustades, cinnamon knots and Kouign amann. The middle day of the week, Wednesday, is reserved for flatbreads and batters, baking without gluten. Don’t think that batters are just for pancakes, it is a type of dough, one that is used to achieve a particular texture. Test this out on socca, a seeded loaf, green pea flatbread, cornbread and blueberry and blue corn pancakes. For the final 2 days, Thursday and Friday we move onto rustic and sourdough, doughs that require a ferment, slowly developing the real depth of flavour and character to crumb and crust. This will be practised on a fougasse, quinoa bread and apple and cider rolls while we wait over night for the sourdough ferments to work their magic. On Friday using these ferments you will develop your sourdough making technique, baking sourdough crackers, sourdough pizzas and various classic sourdough loaves. At the end of the course you will get to take home your very own Bertinet sourdough starter and a scraper. *Please note we do not require customers to have attended our Introduction to Breadmaking course before attending this week or any of the constituent parts as basic techniques will be covered as we go along. Please also note that while you will make sourdoughs on this course, the techniques will only be covered briefly and, as such, anyone wanting to study these types of breads in depth, should consider taking our standard 5 day course. Please call us if you would like advice about which classes are most suitable for you.